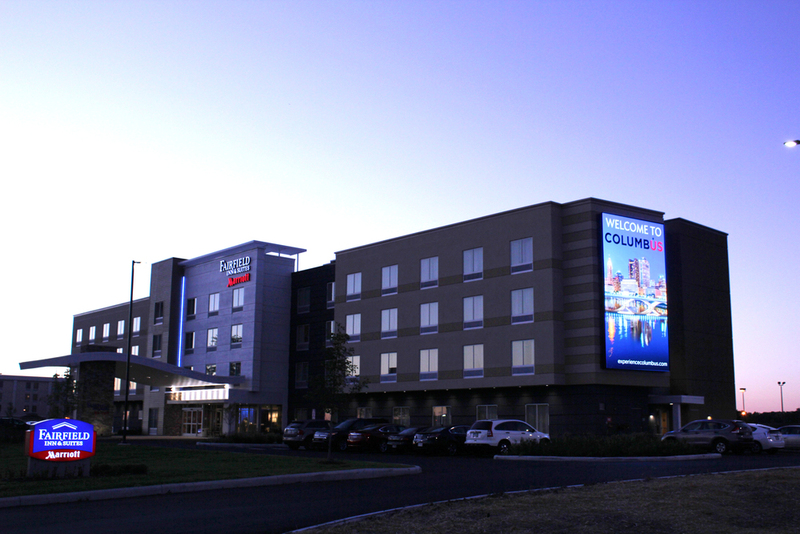 The new LED video screen at the Fairfield Inn & Suites by Marriott at Port Columbus is the first thing visitors see when exiting the airport. The Columbus airport display, manufactured by S|N|A, was recently installed along with a static billboard. Procurement and installation was managed by RBX Media, LLC and Trademark Branding Company, both based on Columbus. The Marriott LED display is similar to another of S|N|A's Marriott video screens: the dynamic digital display at Renaissance St. Louis Airport Hotel by Marriott. The S|Video™ LED display is mounted to the east wall of the hotel, facing traffic leaving the Port Columbus International Airport. The dynamic advertising screen measures approximately 30'0" high by 17'4" wide and employs a 16 mm pixel pitch, making its resolution 570 pixels by 330 pixels. The display includes 188,100 pixels and 564,300 individual LEDs. For ease of service with the wall-mounted display, all components are easily accessed from the front of the display with minimal tools. In addition, due to the height of the display and size of the subframes, S|N|A included custom alignment pins for ease of installation. The pins allowed each subframe section to the easily lowered into place. The digital display will be utilized to add excitement to the area by providing a dynamic medium to communicate local events, fundraising initiatives, airport-specific bulletins, and enhanced lifestyle branding opportunities for off-premise advertising. S|N|A also manufactured and supplied 240-watt LED S|Lighting™ products for the static advertising billboard on the west wall of the hotel. Each of the five Sansi lighting fixtures outputs more than 22,000 lumens, providing enough light for proper viewing of the entire billboard. S|N|A manufactures LED display and LED lighting products across North America and has provided displays for many high-profile customers including Marriott and several Times Square LED video installations such as Express and Minskoff Theatre & MTV Studios.